The vast enterprise of supplying electrical energy in a complex plant presents many engineering problems that provide the factory electrical engineers with a variety of challenges. The so-called challenges start from the beginning of the elementary phase of the planning/reinforcement and continue during the operation of the plant. Further future changes in installed capacity will bring many other problems, which are usually faced by electrical consultants. The supply of energy in the distribution network of a plant must be reliable, safe, secure, technically adequate, and reasonably economical (One million dollar profit lost has been seen in a relatively small plant, due to one hour black out). These are a must in order to produce such a product that remains competitive in the today market. The market will be on the hand of those who control costs because this is the fastest route to increased profit. Having these in mind, TOM consultant, as one of the world leading electrical consultant, has developed a simulation program (PASHA) which copes with a variety of challenges. Power Apparatus & System Homological Analysis (PASHA) is a computer Aided Design and Operation (CADO) tool that helps the power engineers to predict and overcome the above mentioned challenges through the simulation process. PASHA has already been applied to several industrial plants, including Zob Ahan Esfahan (an steel mill plant with 150MW power consumption), Ahwaz Steel Mill Complex (200MW power consumption), Folad Mobarakeh Steel Mill Complex (500MW power consumption), Razi petrochemical plant (60MW power consumption) and in a large interconnected network with 15,000MW peak load including the dispatching center where it is using in the day to day operational strategy decision making. Due to the use of highly sophisticated computer simulation, we in TOM together with our customers succeeded to achieve many goals among them energy saving in the steel mill plants may be highlighted. Energy saving has mostly been achieved in the electric arc furnaces although the loss reduction in the power distribution network can also be notified. Simulation of the plant will be ended up with many other advantages such as checking the equipment adequacy (e.g. circuit breakers and relay coordination), tuning the control strategy (e.g. SVC’s tuning up according to the condition of operation), adjustments of the circuit protection (e.g. under-voltage and under-frequency relays setting), and many others. The need for simulation would also increase during the reinforcement when even a small scope change in a plant (such as adding a motor) must be carefully judged. During the day to day operation of the plant the easy making suggestion feature of the simulation program provides a secure and reliable operation for our customers. The above mentioned providence and many other goals can be brought to your plant, if you proceed according to the following specification. Think about what you gain and consider that we are always here to share your problems. The following requirement specifications are written to clarify the objectives of this contract proposal for the study of technically adequate and reasonably economical operation of a steel mill plant. The work which are referred here in after will be carried out on the basis of consultancy whereby the customer is provided with written and verbal information and guidelines sufficient for his engineers to tune the various devices and equipment in order to achieve a safe and quasi optimal operation of the plant. The work also leads to the implementation of the electrical distribution network of the customer plant in TOM’s software product, appropriate for the customer to further study the present behavior of the plant during the operation. It is anticipated that the implemented distribution network will be further enhanced by the customer own engineers in future possible reinforcement studies. Moreover, the comprehensive and user friendly facilities of PASHA together with our support are always there to help our customers. The scope of this contract proposal is based on a modular selection of the appropriate study by the customer. Customer may select any module of the required type, as long as an omission of a module does not violate the implementation of the others. ac induction motors. Other loads will be represented by their lumped parametric models. Arc furnaces and any other special loads will be treated exceptionally. Before any pricing shall be made the customer must provide TOM with a single line diagram of the plant distribution network together with a copy of this contract proposal filled up with the selected options. Power Apparatus & System Homological Analysis (PASHA) is a highly interactive and graphic oriented CADO tool, designed to improve the analysis of planning and operation of electric utility and industrial systems. This highly comprehensive package remains at the heart of the following proposal. The customer is required to buy the software before any part of this contract proposal turns into a major contract. Some especial equipment model and parameters may need to be determined by identification methods. These are treated exceptionally. Among many advantages that are the result of the entire plant data gathering within the PASHA, the availability of them at the touch of a button is worth to be mentioned here. The state of the art of power system modeling and simulation has been fully approved during the decades. PASHA implements these traditional approaches of modeling in its highly sophisticated modules. However, from time to time cases occur that need more elaborate models to be incorporated inside the simulation studies. Arc furnaces and SVCs are among those equipment, which need special treatment. Appropriate setting of the arc furnace controllers together with its optimal operation strategy, need the implementation of suitable models during the simulation studies. The dynamic model of the furnaces and the SVCs can be obtained by using identification method. The process, which has been shown its effectiveness in our previous steel mill complex studies. Load flow study determines the most appropriate strategy for the operation of the plant. The results so far obtained in the other plants have shown that there are many advantages relating to this study. The following is worth to be mentioned here. The results of L-G, L-L, L-L-G, L-L-L faults will be provided for the customer in appropriate plots and lists. The asymmetric peak and symmetric RMS currents and short circuit capacities are calculated. All the circuit breakers will be checked against their over capacity breaking and making duties. The checking may reinitiate by the customer in case of the network major topological change at the touch a button. Phase, earth, unit, and distance protection will be checked against their discrepancy of coordinate operation. The checking will be done for the current operation condition. The checking may reinitiate by the customer in case of the network major topological change at the touch a button. 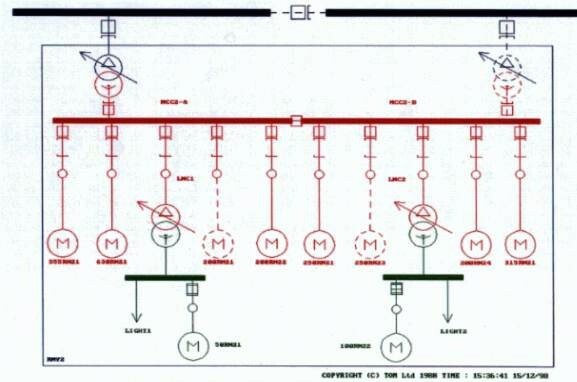 If as a result of the previous stage any miss-coordination has been addressed, the proper setting will be suggested for the relays that are not appropriately coordinated. Any problem reported on the starting of motors will be focussed and an appropriate solution will be recommended. Our past experience shows that a minor tuning strategy provides smoother starting of the induction motors. The stability of the co-generations, synchronous and induction motors under feasible faults and equipment switching will be analyzed and the appropriate solution will be recommended. The present load shedding strategy including the under-voltage and under-frequency relays behavior will be investigated. The most optimal load shedding strategy will be suggested. Harmonic studies will be carried out and any inappropriate filtering or resonance condition will be highlighted. The method of recovery will be suggested. Our past experience shows that a minor tuning removes the possibility of resonance condition and so reduces the possible damage to the plant apparatus.